Persepolis is the name of one of the ancient cities of Iran that consistently over the years was the magnificent and ceremonial capital of Iran kingdom during the Achaemenid Empire. In this ancient city there exists a building called Persepolis (Takht-e-Jamshid) which is constructed during the reign of Darius, Xerxes (New-Persian Khashayar, more correctly, khašāyāršā), and Artaxerxes I (Ardeshir I), and for about 50 years was the center for ritual ceremonies, especially Nowruz. The founder of this huge complex (Persepolis) was Darius the Great, most of the available information about the history and culture of the Achaemenian is due to the stone inscriptions which are engraved on the walls and tiles of the palace. The full extent of Persepolis (Takht-e-Jamshid) palaces is 125 thousand square meters. 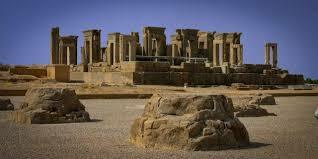 At the time of construction the name of Persepolis was ―Pārśa‖ meaning ―the city of Persian‖. The Greek called it Persepolis (in Greek it means ―Parse City‖). In contemporary Farsi this building is called Takht-e-Jamshid or the kingdom of Jamshid, the legendary king of Iran. This complex has been recorded in the list of Iran‘s Historical Works in the UNESCO Global Heritage from 1979. THE GEOGRAPHIC LOCATION OF PERSEPOLIS (TAKHT-E-JAMSHID) Persepolis is located in the capital city of Fars province, 10 kilometers north of Marvdasht and 57 kilometers of Shiraz. Its height from above the sea level is 1770 meters. In the East side of this complex palaces are leaning on Kuh-e-Rahmat (The mountain of Mercy), and other three parts are extended to the Marvdasht plain. Takht-e-Jamshid is built on Soffeh or a stone platform which is 8 to 18 meters above the Marvdasht plain. Dimensions of Takht-e-Jamshid are 445 meters (West), 300 meters (North), 430 meters (East), and 390 28 meters (South). Also, the length of Takht-e-Jamshid is equal to the length of Acropolis in Athens, but its width is four to five times the width of Acropolis. Introduction to the oldest part of Persepolis (Takht-e-Jamshid) Archaeological evidences show that the oldest parts of Persepolis date from 518 BC. As cited in various historical sources, the construction of Persepolis (Takht-e-Jamshid) began about 25 centuries ago on the West hillside of Kuh-e-Rahmat (the mountain of mercy) or Mitrayamehr at the time of Darius the great and after that it has been continued by his successors with some alterations in its original building. ARCHAEOLOGICAL RESEARCH The first scientific excavations at Persepolis were carried out by the German Ernest Emil Herzfeld in 1931. He was sent by the Oriental institute of Chicago University. His findings are still being kept in this institute. Herzfeld believed that the reasons behind the construction of Persepolis were the need for a royal and majestic atmosphere, a symbol of the Empire and a place to celebrate special events, especially Nowruz. For historical reasons, Persepolis was built where the Persian Empire was founded, although it was not the center of the empire at that time. THE UNIQUE ARCHITECTURE OF PERSEPOLIS Architects, artists and professionals of the construction of Persepolis were from different nations under the reign of the Achaemenid kings such as Assyrians, Egyptians, Urartuians, Babylonians, Ludians, Ionians, Hindu, Scythians, and etc. Over time a number of the pillars of the gate of Sad Sotun (One Hundred columns) palace in Persepolis survived catastrophes such as earthquakes. At first glance they seem to be integrated, but in fact they are fragmented and are mounted on each other. The secret behind their stability against earthquake is in the joint part of these fragments, where two pieces of pillars are joined together by the use of molten lead. In addition to strengthening the joint of the two pillars, this lead has a vital role in resistance of the structureagainst earthquake. Lead is a malleable and soft metal that at the time of earthquake reacts and does not split, and this is the same role which is played by the springs put between the pillars in the modernbuildings. Persepolis architecture is noted for its use of wooden columns. Architects resorted to stone only when the largest cedars of Lebanon or teak trees of India did not fulfill the required sizes to bear the ceiling. Column bases and capitals were made of stone. One of the architectural arts in Takht-e-Jamshid is that the ratio of portals‘ height to their width and ratio of pillars‘ height to the distance between the two pillars are golden ratios. Golden Ratio is important ratio in Geometry that exists in the nature. This shows the art of traditional Iranians is Architecture.